A temple 31 miles north of Aswan, Egypt has a unique configuration and provides unusual images of ancient surgical instruments. In about 1400 B.C., Pharaoh Thutmose III erected a temple overlooking the Nile River for worshipping the god Sobek, usually shown with a crocodile head. Thutmose hoped that honoring Sobek would placate the area’s vicious crocodiles. By the second century B.C., the temple, near Kom Ombo, had fallen into ruins. Pharaoh Ptolemy VI Philometor, whose reign began in 180 B.C., believed Sobek deserved a new temple. Not wanting to offend Sobek’s rival, the falcon-headed Horus, Ptolemy built a limestone temple featuring two identical, side-by-side sections, one devoted to Sobek and the other to Horus. Succeeding pharaohs expanded the dual temple, adding a secret chamber between the sanctuaries where a priest, pretending to be an oracle, could answer questions about the gods’ desires. A circular well with steps to the bottom functioned as a nilometer, allowing priests to determine the level of the Nile during its annual flooding. Rome annexed Egypt as a province in 30 B.C., and Caesar Augustus added a forecourt and reliefs to the Kom Ombo temple. After Christianity became legal in the Roman Empire in the fourth century A.D., Christians used the temple as a church. As worshippers did in other temple/churches, they defaced images they considered pagan. 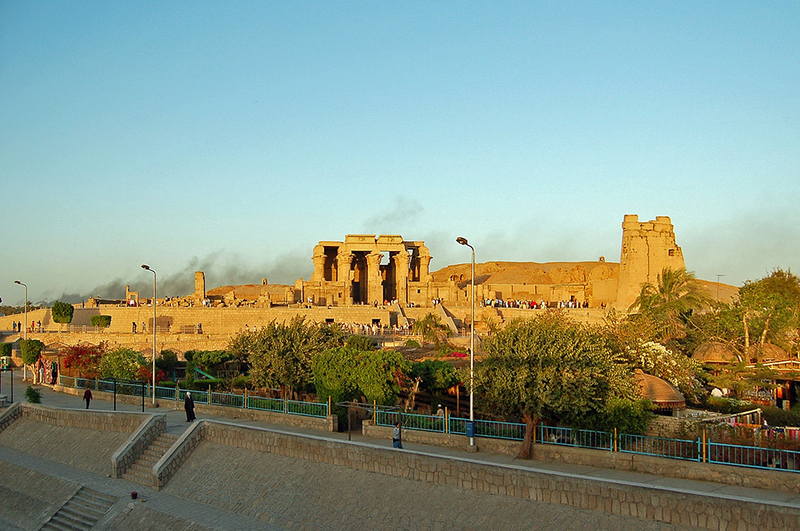 Flooding, earthquakes and scavengers eventually destroyed much of the Kom Ombo temple. In the 19th century, during restoration of the remainder, workers found 300 crocodile mummies, a few of them now displayed in a room in the temple. Workers also found reliefs along the temple’s rear wall depicting about 40 Roman-era medical instruments. Carved representations of scalpels, forceps, scissors, catheters, bone saws, medicine bottles, specula, suction cups and dental tools are assembled between a basin and goddesses on birthing stools.